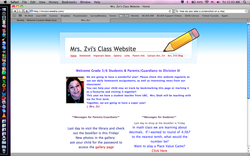 My first field study involved increasing communication with students and parents through the use of a class website. How can I enhance my practice through the use of technology, such as a website, to increase communication with my student and parent community? Will parents/students be more willing to be active participants in learning? Do students have technology or access to technology to be able to use the class website? What do parents and students need in a website? Will the use of the website increase homework completion by the due date? How can we keep track of parents/students visiting the website? How can we motivate parents/students to use the website? How do I measure my success? What is the data I collect? Will it save time in not having to write out missed work for absent students? Over the past few months, I have noticed that it is the same few students who use the website all the time, at first this got me down because I wanted all of them to use it; however, then I realized that 100% usage is not realistic so I am really happy that my website has at least really helped/impacted a few of my students.